What a perfect mantra. Simple, yet sound. Tapping into the essence of our lives – that breath that constantly rolls forward, just as we carry on in age, experience, and physical locale. This particular mantra surfaced on the backside of a bracelet my best friend from childhood gifted me over the Christmas holiday. Most bracelets don’t fit me, but this one – and the one centered on positivity that my boyfriend’s mom had given me a few weeks earlier – happen to. For the first time in 25 years, I feel like I’ll actually wear bracelets – these bracelets – and not so much for the purpose of accessorizing, but to extract the bands’ powerful messages. I’d been having a strong urge to tattoo ‘breathe’ on the inside of my left wrist, as a reminder to do just that when I become frustrated, flustered, or distressed. The power of that act is something I find myself continually reminding my students of and yet this fall hadn’t been so successful in implementing myself. So what a perfect gift when I saw what the inside of the bracelet held. I had found my tattoo – in bracelet form – thanks to Emily and the all-knowing universe that led her to find such an intention for me. As soon as I arrived home to Wisconsin, a cold overtook my body. It normally wouldn’t be such a big deal, but something about being home and socializing constantly with family and friends I don’t get to see often brought on even more fatigue and in my case, a stark vulnerability (which for an already sensitive being can get rough). I felt myself slipping into a more observant, quieter role, a place I used to live when I was young but don’t inhabit as often these days in NYC, and I wasn’t so excited about it. While I may not be the life of the party, I feel as if I’ve developed a certain comfort in my social life as an adult; most of the time I can live in the center of it all, rather than on the outskirts. I suppose our places in social space can vary depending on our surroundings. It’s probably perfectly natural to fall into patterns of the past when we meet up with old friends and the family that has known us since birth. There can be a real beauty to reunions and our tendency within them to be just as we were. Yet there was something about the way I was becoming that seemed isolating – it felt as if my lacking energy was hindering honesty and richness in my interactions with others. I wanted to be enthusiastic and instead felt bland. I wanted to be as I am now, not as I was, and falling short of that goal just hit me harder; my cold wedged me into a pitty party. Breathing was exactly what I needed to do to move on and out of my gratuitous stupor. Emily’s bracelet abruptly drew me back to the present: to not make the most of my time with my family and friends from home would be disappointing once I returned to the city. I needed to make the most of my time with them, with or without a cold. Our family is like the branches of a tree. We may grow in different directions yet our roots remain as one. A few weeks back, my voice teacher had suggested I listen to the lessons I’d recorded nine months ago, to hear where I was then and recognize how far I’d come. The second piece to her reasoning was especially intriguing to me – while she wanted me to notice what skills had improved, she also wanted me to observe what strengths I had nine months ago that I might have let slip away in focusing on other aspects of my voice. There could be colors in there, she offered, that could create a real fullness in my sound, if only I could unite it all. 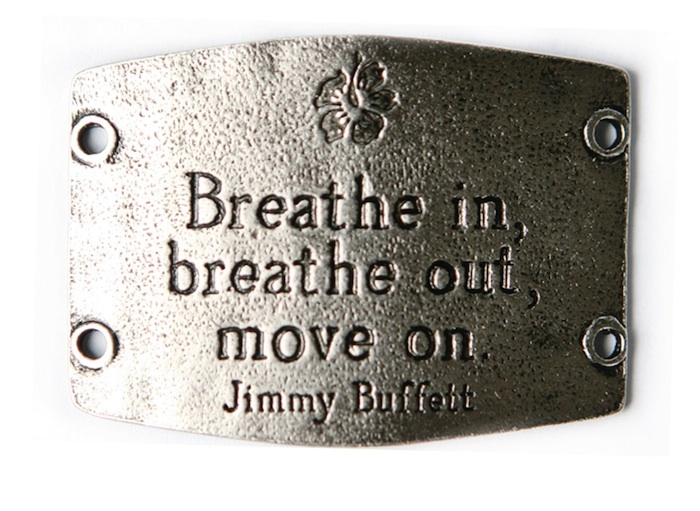 Her thoughts offer me a different perspective on the bracelet’s mantra. I initially had thought of the breath and its passage forward as a linear route, a ‘just keep swimming, just keep swimming’ sort of journey. But now that I think about it, aren’t our lives meant to take on a fuller shape? What we pass through each year, each moment doesn’t have to be left behind, for it’s those pieces of ourselves that make us who we are as individuals and that in turn, influence our communities, as we individuals interact with one another. Perhaps as we enter into the new year, we can offer ourselves the opportunity to set more pliable goals, elastic in the sense that they do look to our future, but don’t negate all that has come before us that can support us in our journeys onward. Our paths forward – in the ways of family, friends, career, health, and all else – could be like balloons. Instead of having to be so straight and flat, we could allow them to get fuller and fuller as we draw in all that brings us to each point, and as we continue to breathe.